Electric Fields , who we’ll see in the upcoming national selecrtion Eurovision – Australia Decides, performed for the first time live their national selection entry . 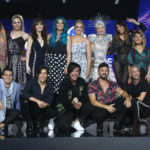 Australias’s first national final, Eurovision – Australia Decides is set to take place on February 8 and 9 at Gold Coast. The national final will unfold over two nights while the live voting will take place on February 9. Host of the show will be , Eurovision 2017 commentators, Myf Warhurst και Joel Creasey. In 2018 Jessica Mauboy represented the country in Lisbon “We Got Love”, which finished 20th with 99 βαθμούς.